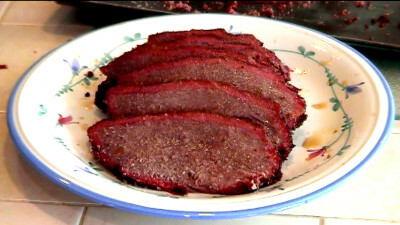 SmokingPit.com - Hickory & Apple Smoked Beef Brisket - Slow cooked on a Treager Pellet grill. When purchasing a brisket you can get a whole brisket with the point or just a flat. Look for grain running end to end if possible. Diagonal is ok but try and avoid the cuts with a hard cure to the grain. Why? When it comes time to cut the brisket you want to cut across the grain. This will produce pieces of brisket that are easy to pull apart and therefore chew. A harsh curve to the grain and parts of each cut will be tough and others tender. We don't want inconsistency. Aging of the meat is a factor in tenderness as well. now days it isn't as much of an issue but I still like to let that fabulous hunk of protein hang out in the refrigerator for a few days. If anything, it help pump me up for the big cook! After you purchase your brisket let it sit in the refrigerator for 3 days to age a bit more. When choosing your brisket carefully look at the grain. You want the grain to run horizontal along the length of the brisket if possible. If the best you can do is a angle grain that's ok just avoid a grain with a large curve to it. This will produce an inconsistent tenderness. Some parts of each slice will be tougher then others. The day before the cook rinse the brisket and trim the fat. A good brisket will have marbling in the meat. This is what you want. 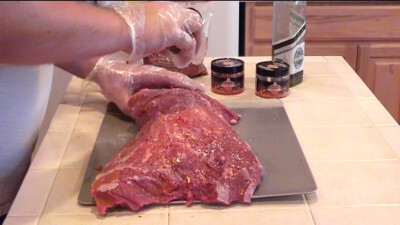 You don't want a allot of external fat as it will keep the spices, rub and smoke flavors from permeating the meat. Once the brisket is cleaned and trimmed, wipe down with olive oil. This will allow the spices and dry rub to adhere to the brisket. Shake on some Montréal Steak seasoning and some Dried Tomato and Garlic Pesto mix. Put on the amount you wish. Don't be shy. Shake on liberal amounts of McCormick's Sweet & Smokey dry rub and then work it in with your hands. Once the rub is on shake on some more Montreal Steak seasoning and some Dried Tomato & Garlic Pesto mix. Sprinkle on some brown sugar and rub into the brisket. Once both sides are done wrap in plastic wrap and place in the refrigerator until the next morning. Mix up some Au-Jus over heat and then place in a Tupperware bowl until the morning. this will serve as a flavor injection. The following morning take the brisket and Au-Jus out early. Let stand at room temperature for about 2 hours. After brisket has warmed up inject every couple inches with Au-Jus. Push plunger of flavor injector as you withdraw the injector. This will allow for good coverage. Pre-Heat smoker to 230 degrees. 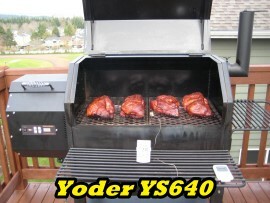 Traeger grill owners, once heated to 230 turn to "smoke" setting. Place brisket in smoker. Cook for 2 hours on smoke then 3 hours at 230 degrees. Standard smokers 5 hours at 230 degrees. Mist with apple juice hourly. Monitor temperature. After 5 hours on the grill the brisket should be above 140 degrees. Remove and place on foil. Mop with Au-Jus then sprinkle on spices and dry rub. Wrap in foil and add 1/2 cup Au-Jus to foil. Seal up and place back on smoker. Cook at 230 degrees until brisket reaches 180 degrees. Remove from foil and place back on smoker rack. Continue cooking until the internal temperature is 190 degrees. 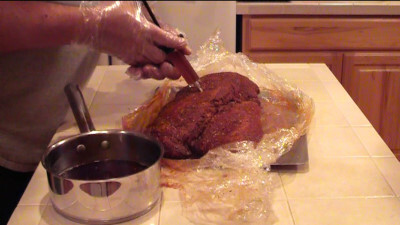 Remove brisket and let stand for 45 minutes covered with foil. 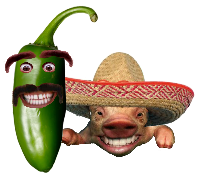 This will allow the internal juices to re-distribute. Slice across the grain 1/8 " think. At this point I like to dip each slice in Au-Jus as I arrange onto a meat platter or plate. The brisket should have a nice thick pink smoke ring and should be very tender. See picture on right.